Image courtesy Amanda Wild (CC BY 2.0). A free cloud-based app enables forest owners and managers to estimate the growth and production of eucalyptus plantations through simulations. 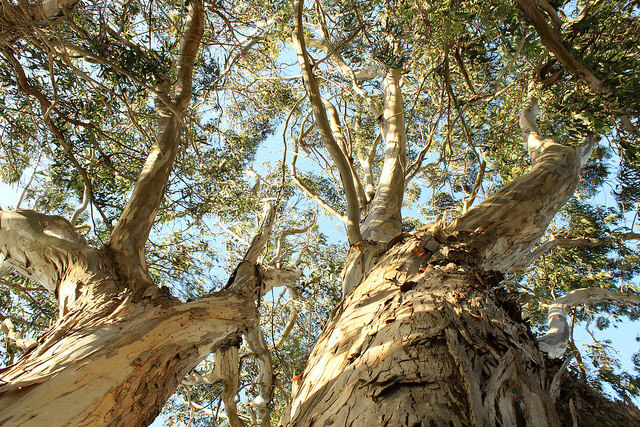 EucaTool has been designed specifically for the species Eucalyptus globulus. The app is aimed at forest owners and managers in Spain, but could also be beneficial for scientists, teachers, and students. Models are useful for enabling forest owners and managers to adjust their actions and keep their plantations sustainable. Forestry engineers from VSonCloud and the Sustainable Forest Management Unit at the University of Santiago de Compostela (USC) have developed a new free cloud-based app called EucaTool. The app is aimed at forest owners and managers, but could also be useful for scientists, teachers, and students. EucaTool is designed to estimate the growth and production of eucalyptus plantations through simulations. Models like this are useful for forest owners and managers to adjust their actions to keep their plantation sustainable. The blue gum (Eucalyptus globulus) is a significant production species in Spain as it is the main source of short pulp fiber in the EU. Plantations in north-west Spain yield 3.5-4 million cubic meters of bark, approximately 38% of the volume of all tree species commercially harvested in Spain. The simulations work by integrating transition functions for dominant height, number of stems, and basal area. This makes it possible for stakeholders to estimate the volume, biomass, growth, production, and carbon content of their plantations. Either individual tree data or the plantation average has to be entered into the app, which then uses a series of equations to perform the calculations. Data required includes either (1) the diameter and height of all (or at least some) trees or (2) the age of the plantation, number of trees per hectare, and height of the dominant trees and basal area of the plantation. To make EucaTool the researchers had to develop a growth and yield dynamic model, which consists of a series of mathematical equations and relationships obtained from measurements or empirical data. Collecting this data required almost four years of research and included three measurements of a network of 128 Eucalyptus globulus plots spread over many plantations in Galicia, Spain. The research team has also previously developed similar dynamic models for oak, birch, and three species of pines on another computer simulator called GesMO. EucaTool does not, however, provide accurate predictions for species other than the blue gum.